Finished Size: 9.5" x 4.125"
When Will I Get My #10 Window Envelopes? 5,000 and under #10 Window Envelopes: Ships or ready for pick up in 2 business days from proof approval. Over 5,000 #10 Window Envelopes: Ships or ready for pick up in 5 business days from proof approval. #10 window envelope printing from 48HourPrint.com to give your business correspondence a professional look and great appeal. You can be sure that you are getting #10 window envelope printing with 48HourPrint.com. Our online envelope printing services also include our industry-leading 48 Hour Turnaround Guarantee for quantities of 5,000 or fewer envelopes. Printed #10 window envelopes are a versatile tool for mailing items to customers and prospects. Window envelopes give them a peek at what is inside and can make preparing mailings faster and easier without having to separately address envelopes. Print your logo and return address on the window envelope and present your company professionally with our envelope printing services. In addition to #10 window envelope printing, our online envelope printing services include #10 envelopes, #9 envelopes, A2 envelopes, A6 envelopes, A7 envelopes, A9 envelopes,9x12 envelopes, and 10x13 envelopes. 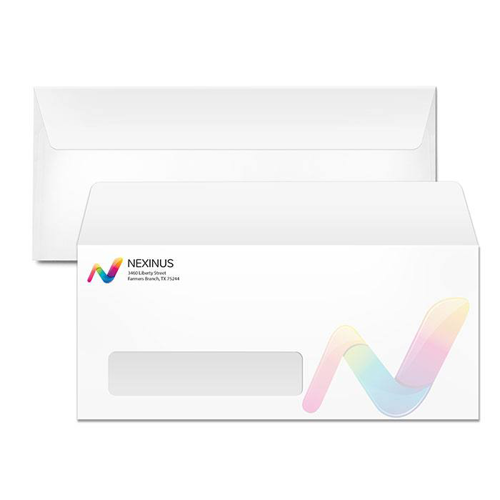 All of our printed envelopes are full color one side and are printed on laser and inkjet printer-compatible paper stock with your choice of 70# Opaque Text or 24# White Wove stock.